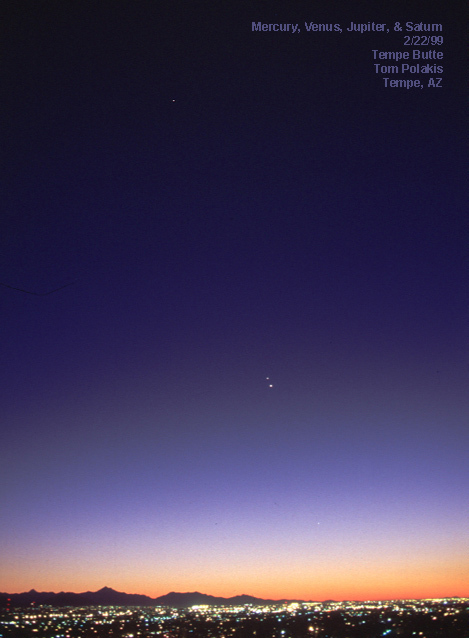 Opis: Venus and Jupiter appeared unusually close together in the sky last month. The conjunction was easily visible to the unaided eye because Venus appears brighter than any background star. The two planets were not significantly closer in space - Venus just passed nearly in front of Jupiter as seen from the Earth. Visible in the above photograph are actually five planets. The faint dot near the top is Saturn. Venus is the brightest spot near the center, and Jupiter is just above it. 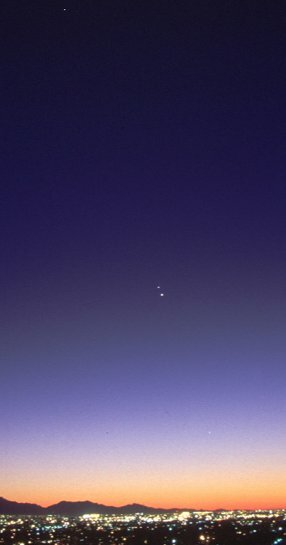 Perhaps the hardest to see is Mercury, visible below Venus but above the foreground Earth. A single line nearly connects all the planets, a result of all planets orbiting the Sun in a single plane called the ecliptic.